Tom Oar has made his name with the success of Mountain Men, a hit American reality television series on the History channel that started airing its first season back in 2012. The series is narrated by D.B. Sweeney and features Tom Oar as one of the main casts including Charlie Tucker, Eustace Conway, and Rich Lewis among other names. The series is currently in its sixth season now. The show focuses on Americans living with what nature provides and their bare two hands to survive. It depicts what living and surviving was like before today’s modern day. Tom Oar likes to keep it traditional and is making great bucks because of the success of the series. 1 1. Tom Oar net worth is estimated to be $300,000. 2 2. Tom was an impressive rodeo rider with an impressive record. 3 3. The couple hand built their log house. 4 4. He does exactly what the Indians did 200 years ago. 5 5. The team of Mountain Men casted him after following him for a day. 1. 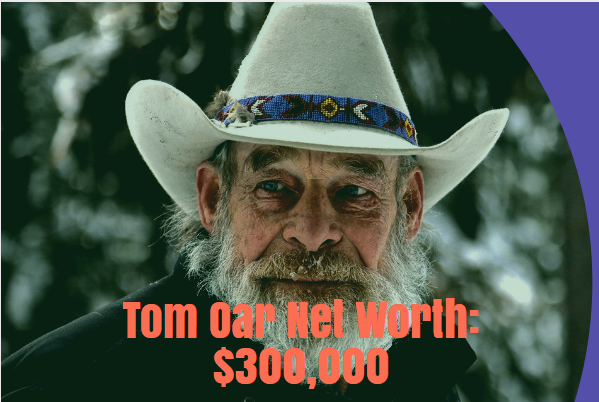 Tom Oar net worth is estimated to be $300,000. As of 2018, Tom Oar net worth is estimated to be between $200,000 and $300,000. Although in the show, it has been focused upon how Tom and his wife Nancy Oar make the majority of their income from tanning hide. They also create other traditional buckskin moccasins, pants, shirts, and jackets. He has highlighted how with the success of the show, it has become almost impossible to keep up with the massive orders. But thankfully, Tom doesn’t work for free to be on TV. He gets paid a very good amount which is more than enough keeping in mind the lifestyle that he and his family carries. With Tom coming to age, he might have to think about slowing down on his tanned hides that make up to $4500 per unit. 2. Tom was an impressive rodeo rider with an impressive record. Tom was a farmer rodeo trick rider and rode broncs for 25 years. His father used to work for a Wild West show in his hometown Illinois when Tom himself was a kid. From 3 year old even upto 15, he had a lot of exposure to this field of work. He has mentioned that his passion in being a rodeo rider started right at that time. He went on to master this craft to perfection. Thus, it is of no surprise that Tom went on to make it to the International Finals Rodeo for eight times. This was an extraordinary feat back in his days. 3. The couple hand built their log house. After realizing that Tom’s rodeo days were soon coming to an end. The couple decided that they wanted to move to Montana. They simply bought a chainsaw and with their old truck started making a log house. They have now lived in this unique and special home for more than 35 years now the old traditional way. With the closest grocery store 50 miles away from their residence, they rely on hunting for their food. Tom tans deer hides whilst Nancy prepares the chickens for dinner. In an interview, Tom even stated that they spent more than 15 years without electricity. 4. He does exactly what the Indians did 200 years ago. Tom is the type of person who would have preferred to be born a good 250 years ago. Tom and Nancy make products the same way that they were made back in the 1800’s which is probably one of the reasons for their success in selling these fur trades. The braintans buckskin may have never been heard of if it weren’t for these guys. To the modern viewer, such a lifestyle is very unique and is the reason why the show manages to get great ratings every season. 5. The team of Mountain Men casted him after following him for a day. One of Tom’s neighbors had recommended the Mountain Men crew to scout on Tom for a day. They were very impressed with him and the story that he had. It looks to have been very good decision as Tom is has the perfect personality to cope with such conditions. Many of the Mountain Men viewers love when Tom appears in the show and is no doubt one of the reasons why his business personally is doing well too. With Tom getting older by the day, we don’t know how long he and Nancy will be able to maintain such a lifestyle.